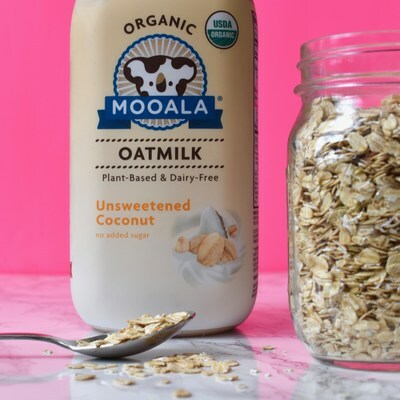 DALLAS, Jan. 30, 2019 /PRNewswire/ — To equip consumers with additional tools to maintain their New Year’s wellness goals, Mooala, a leading maker of premium, organic, dairy-free beverages, today announced the launch of its newest innovation: Organic Coconut Oatmilk—the industry’s first refrigerated organic oatmilk to hit the U.S. market. Meeting the need for a better-for-you oatmilk, Mooala’s new Coconut Oatmilk is a tasty, sugar-free, USDA-certified organic dairy alternative crafted to help healthy shoppers enjoy their favorite foods guilt-fre e. The new oatmilk will be first available in the refrigerated aisle in Whole Foods regionally, and it is available to retailers nationally through UNFI and KeHE. Created with USDA organic and non-GMO ingredients like toasted oats blended with coconut cream and a hint of cinnamon, Mooala’s Organic Coconut Oatmilk (MSRP: $5.99) has no added sugar and only 50 calories per serving. The brand’s latest innovation incorporates Mooala’s signature core values—the oatmilk is organic, soy-, dairy-, gluten- and carrageenan-free, with no preservatives added. The new oatmilk also has as much calcium as a glass of dairy milk, offering 30 percent of the daily value in an 8 oz serving. Mooala Organic Coconut Oatmilk can be enjoyed on its own, stirred into coffee or easily incorporated into smoothies and tasty recipes like oatmilk oatmeal cookies, oatmilk lattes, and more. Mooala Organic Coconut Oatmilk extends the brand’s line of organic plant-based beverages, including Original Almondmilk, Vanilla Bean Almondmilk, Original Bananamilk, Chocolate Bananamilk and Strawberry Bananamilk, which offers individuals with dietary restrictions, allergies or those striving to make simple better-for-you lifestyle swaps the ability to enjoy a variety of tasty plant-based options guilt-free.